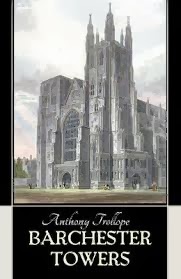 One aspect of Anthony Trollope’s first two books in the Chronicles of Barsetshire series, The Warden and Barchester Towers, is the shifting and playful point of view that the author presents. Both novels are written mostly in third-person point of view. However, at times in the narrative, the prose shifts into first-person. Trollope actually uses at least two different forms of first-person. Very occasionally, he puts himself into the story and recounts conversations that he has had with various characters. At other times, quite often in fact, he actually refers to himself as a novelist and refers to the story as something that he has created. He also directly addresses the reader, calling him or her, “reader”. But let the gentle-hearted reader be under no apprehension whatsoever. It is not destined that Eleanor shall marry Mr. Slope or Bertie Stanhope. Why does Trollope reveal this milestone in the plot so far advance? The reader has no need to speculate. Trollope explains exactly why he does this. And here perhaps it may be allowed to the novelist to explain his views on a very important point in the art of telling tales. He ventures to reprobate that system which goes so far to violate all proper confidence between the author and his readers by maintaining nearly to the end of the third volume a mystery as to the fate of their favourite personage. Nay, more, and worse than this, is too frequently done. Have not often the profoundest efforts of genius been used to baffle the aspirations of the reader, to raise false hopes and false fears, and to give rise to expectations which are never to be realized? Are not promises all but made of delightful horrors, in lieu of which the writer produces nothing but most commonplace realities in his final chapter? "How very ill-natured you are, Susan," says Kitty with tears in her eyes: "I don't care a bit about it now." Dear Kitty, if you will read my book, you may defy the ill-nature of your sister. There shall be no secret that she can tell you. Nay, take the third volume if you please— learn from the last pages all the results of our troubled story, and the story shall have lost none of its interest, if indeed there be any interest in it to lose. I find this marvelously inventive and amusing. I think that Trollope does succeed in creating a certain intimacy with his readers here. It is insightful as well as fun the way that he is letting us in a little on the details of his writing process. Though these variations and digressions seem to be presented in a tongue in cheek and ironic style, I do think that they are meant to say something about writing. Before reading the above, I thought that I was the only one that thought that sometimes too much suspense can actually mar a story that includes very strong and aesthetically pleasing characters. Everything would have been explained, and Eleanor would have gone back to Barchester with a contented mind. How easily would she have forgiven and …had she but heard the whole truth from Mr. Arabin. But then where would have been my novel? There are many additional examples of all this sprinkled throughout the narrative. Without a doubt Trollope’s unconventional twists in his point of view liven up these novels. I tend to be a hound for innovation and variation in storytelling as I think that such experiments add diversity and spice to literature. As I continue to read Trollope I will be persistently watching for more of these intriguing digressions in his prose. My commentary on The Warden is here. 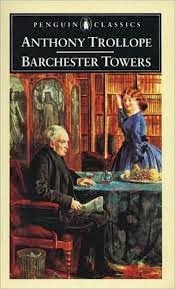 My commentary on Barchester Towers is here. My commentary on Doctor Thorne is here. 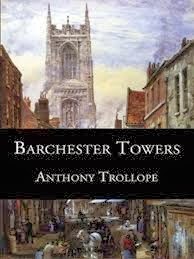 Barchester Towers by Anthony Trollope is the second book in the Chronicles of Barsetshire series. I found this novel to be one of the most enjoyable that I have ever read. It is complex in all sorts of ways, masterfully written, has marvelous characters and, to top it all off, it is very funny. The plot picks up approximately five years since the conclusion of The Warden. Once again, we get to look into the lives of the various inhabitants of the city of Barchester. These include the elderly and meek, yet wise and virtuous, clergyman Septimus Harding, his now widowed daughter, Eleanor Bold, and his overbearing son-in-law, Archdeacon Grantly. When the beloved bishop of the diocese passes away, a new bishop, Dr. Proudie, is appointed. Proudie is an extremely weak man who is controlled by two schemers: his hypocritical and domineering wife, Mrs. Proudie, and his personal minister, the manipulative and self-serving Mr. Obadiah Slope. Both set their sites on taking power in the diocese at the expense of the longtime residents and eventually at the expense of each other. A war of social, political and ecclesiastical maneuvering soon breaks out between the newcomers and the long-term residents. Eventually, Mrs. Proudie and Mr. Slope also begin to vie against one another. Complicating matters is the return of the Stanhope family to Barchester. Dr. Stanhope is a local clergyman who has been living in Italy. The Stanhope children are narcissistic, vulgar and manipulative. Among them are the seductive and calculating Signora Madeline Vesey Neroni and the flippant, irresponsible Ethelbert "Bertie" Stanhope. These characters proceed to cause all sorts of strife in Barchester. I found it difficult to decide where to focus in this post, as this novel is so full of wonderful elements. There is so very much to comment upon here. The aspects that strike me the most are how well crafted and nuanced several of the characters are, and just how amusing, even downright funny, this book is. 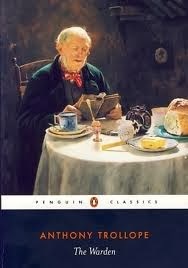 Trollope seems to better understand and represent the complexities of life than do all but a small minority authors. He reflects reality in a way that is amazingly real and multifaceted. When characters act, it is usually for a variety of mixed motives, ranging from the noble to the nefarious. Misunderstandings are often infused with some truth. Situations and people are rarely simplistic. The complexity of the personas that Trollope has created in this work is indeed impressive. The people he has fashioned here may be the most realistic fictional characters that I have ever encountered. As in real life, Barchester is populated with good people, really bad people, and people who are in between. However, unlike the creations of many authors, the good characters almost always show some flaws, and the bad characters occasionally show good traits. The folks who are in the middle are very complicated indeed. In my opinion, Trollope’s in-between characters are the best. Archdeacon Grantly is a case in point. This man is overbearing, arrogant and often a bully. Yet, he seems to have a moral core that is real but imperfect. As his father, the Bishop of Barchester, is on his deathbed, Grantly is indeed distraught. However, the timing of his father’s death is an issue. Because of an impending change in government, if the Bishop dies soon, the Archdeacon will likely be appointed the next Bishop. However, if the old Bishop lives much longer, it is unlikely that the Archdeacon will ever become Bishop. Situations are rarely simple in this novel. Muddling this issue is the fact that the dying Bishop is suffering, so that a reasonable response from a relative would be a desire for the end to come with some haste. Nothing could be easier than the old man's passage from this world to the next. But by no means easy were the emotions of him who sat there watching. He knew it must be now or never. He was already over fifty, and there was little chance that his friends who were now leaving office would soon return to it. No probable British prime minister but he who was now in, he who was so soon to be out, would think of making a bishop of Dr. Grandly. Thus he thought long and sadly, in deep silence, and then gazed at that still living face, and then at last dared to ask himself whether he really longed for his father's death. The effort was a salutary one, and the question was answered in a moment. The proud, wishful, worldly man sank on his knees by the bedside and, taking the bishop's hand within his own, prayed eagerly that sins might be forgiven him. This book is also very funny and sometimes even hilarious. I found myself laughing out loud on several occasions. Once again, as in The Warden I get the sense that the author is taking the middle ground, even in his humor. Trollope skewers conservatism and stuffiness as well as liberality and lack of restraint with equal vigor. The wit ranges from the subtle to the bitingly sarcastic, and occasionally it veers towards the physical. Ironically, I sense that the above displays an understanding of such refuges that people find, even as such refuges are being mocked. There is a lot more here. The work is full of additional fascinating characters that I have not even mentioned. It is brimming with themes and insights. It is chock full of wonderful mythological allusions. The writing style is extremely well crafted and innovative, a point that I will explore in a separate post. This is a highly recommended read for anyone with the slightest inclination toward nineteenth century English novels. Unless a person were to be completely adverse to that art form, it is hard to imagine why anyone would not like this book. As someone who insists upon reading series in order, I would recommend the very worthwhile The Warden first. I cannot wait to move on to the later entries in this series.